Seattleites may not know it, but right in our backyard is one of the country’s (actually, the world’s) top purveyors of that darling of the kitchen: gourmet salts. SaltWorks up in Woodinville has been in this business since 2001. Its earliest inception is one of those classic entrepreneurial stories of a one-time hobby taking over someone’s life to the point that there was little choice but to open a business given the hobby’s growing demand for space. The entrepreneurs in this case are Naomi Novotny and Mark Zoske, who had little idea what they were going to become when first developing the brand out of a spare bedroom in their home. Today they’re importing salt from 21 countries around the world, including Sicily, Australia, France, Mexico and Japan. 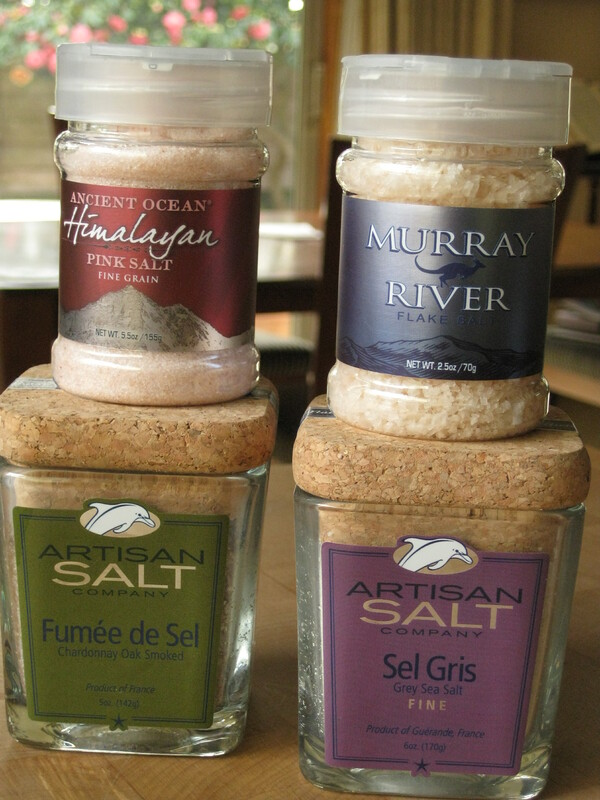 Among the distinctive salts is a range of Himalayan pink salts (mined from ancient sea beds) that are all the rage right now, plus items like Alaea sea salt from Hawaii, a classic ingredient in kalua pig (kala namak), accented with red clay with provides a slightly sulpherous character, and Hiwa Kai charcoal-enhanced salts that help further accentuate other flavors as a finishing salt. Part of what has set this company apart is investment in technology the likes of optic cleaning, which through the miracle of modern technology is able to detect and remove the smallest specks of debris from salt before it’s packaged. And they have invested, too, in smokers so that they custom-smoke the fumée de sel (over Chardonnay vine wood; woods used for other smoked salts include pecan and apple), a product in their artisan line which also gets sprinkled over the caramel mocha drinks at Starbucks. Which reflects one current trend noted on the recent visit: that artisan, specialty salts are beginning to move from our home kitchens and the realm of the restaurant chef into large-scale commercial use. SaltWorks has long sold salts wholesale to such companies, sending off palette loads of elegant and flavorful salts that will end up in consumer products we buy in the course of our busy days. I’d been on a tour of their previous facilities a few years ago, already an impressive spread of warehouse space. But just last year the company moved into even larger space not far from their original spot in Woodinville, which I got to visit a few months ago. Now totaling 130,000 square feet that, the space seems more than ample but Naomi hints that they’re already feeling the likelihood of reaching the space’s capacity before long. It’s clear this locally-grown company is doing everything it can to help satisfy our growing desire for high-quality salt, and clear that SaltWorks is still on a path of growth. Those of us in the area are lucky enough to be able to visit the well-stocked retail space they have at the front of their warehouse facility. Pop in Monday through Friday at 16240 Woodinville-Redmond Road NE in Woodinville for a taste of what this stellar purveyor of artisan salts has going on.